[Printed magazine.] The first issue of 'The 18-30 Review', March 1949, devoted to conscription ('National Service'), with main article 'The Lost Opportunity' by Basil Henriques. 8pp., 4to. Stapled and unbound. In fair condition on aged paper. On the first page the 'object of this Review' is described as 'to provide a forum for discussion in which the organisations represented on the 18-30 Conference and their individual members can express their views on subject of common interest'. On the last page the 18-30 Conference is described as 'a consultative body', inaugurated in November 1946, 'established in recognition of the need to provide a forum for discussion on the interests of young citizens in the manifold activities of national life'. Autograph Letter Signed from the sociologist Morris Ginsberg to the social anthropologist J. H. Driberg, arranging a meeting with 'anthropologists' after giving a paper at the Cambridge Historical Society. On letterhead of 35 Redington Road, Hampstead, NW3 [London]. 28 December 1937. 1p., 4to. 12 lines. Good, on lightly-aged paper. He was not able to reply to Driberg's letter sooner because he was arranging with the secretary of the Cambridge Historical Society to deliver a paper to be entitled 'Theories of the Causes of Wars'. He wonders whether Driberg's 'anthropologists' might not be able to 'join in the meeting - or possibly I might to talk [sic] to them on the following day'. He does not think he will be able to find time the following term. 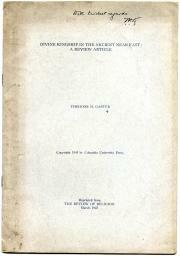 Ginsberg's paper 'The Causes of War' was published in 1939 in the Sociological Review. 8vo: 55 pp. Disbound. Tight, on aged, grubby paper, with wear to the title-leaf, which has a 7cm closed tear along the spine. 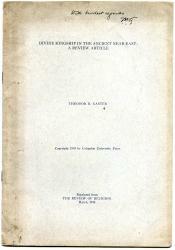 Inscribed at head of title-page: 'Rev. S. Martin wh ye Authors Affec regards'. 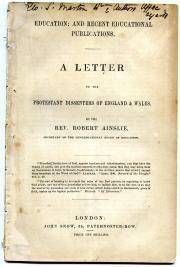 An informed discussion, with footnotes, tables and statistics, of the desirability of the education of the poor, by a correspondent of Charles Darwin. 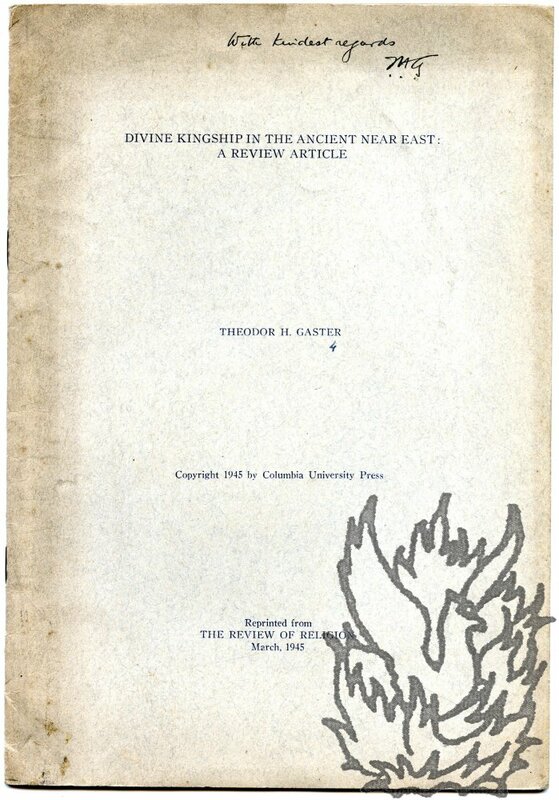 Excessively scarce: no copy at the British Library, and the only copy on COPAC at King's College, London. Autograph Letter Signed ('Alfred Fouillée, Membre de l'Institut'), in French, to unnamed male correspondent. 13 March 1902; 'Menton, villa Fouillée'. 12mo, 2 pp, 13 lines. Good, on lightly aged paper. He is sending his reply (not present) to an article by André Beaumier 'qui me concerne (Figaro du 11 mars)'. The question of university reform is important and 'à l'ordre du jour', consequently he asks his correspondent to make use of his reply. Fouillee was, according to J. A. Scott, 'the founder of French solidarist philosophy'. Loosely inserted in blue paper folder with catalogue entry for the previous sale of the item laid down on front. Autograph Letter Signed to Fanny [Brough]. Three pages, 12mo. Very good. The letterhead, in red, carries Mayhew's crest, with his initials 'HM' and motto 'LABOR VINCIT'. An insight into doings within the Mayhew family. As her correspondent has 'not been here', she is concerned that she 'must have offended you in some way or another'. Typed Letter Signed to Professor R[ichard]. H[enry]. Tawney. Eminent American sociologist and economist (1882-1969) and nudist. The recipient (1880-1962) was an equally eminent English economic historian, social critic and reformer. Two pages, quarto. On discoloured, sunned paper. The lawfulness and obligation of oaths. 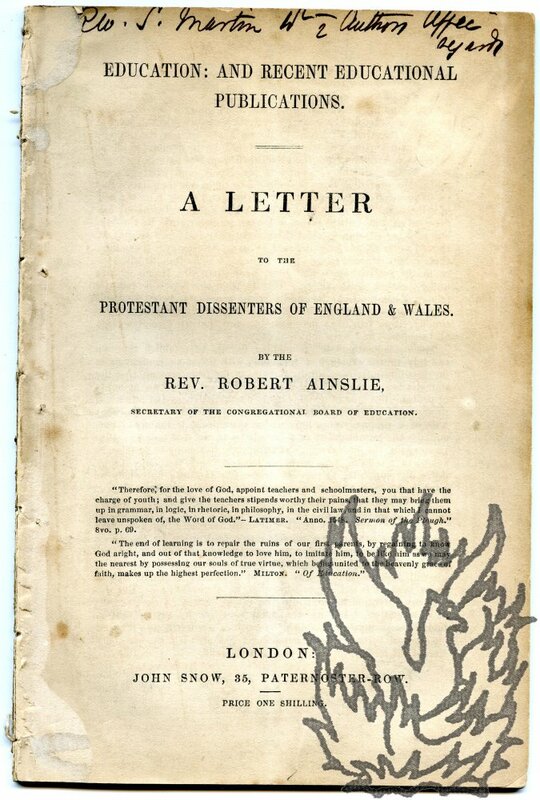 A dissertation which obtained the Hulsean Prize for the year 1844. Cambridge: printed at the University Press [...]. 1845. Octavo. 84 pages. A disbound pamphlet from the Churchill Babington collection. Very good with light foxing to prelims. 'Amongst all the institutions which contribute to strengthen the bonds of society, by establishing and confirming that mutual trust and confidence among men which is necessary to its very existence, there is none which exercises a more considerable and beneficial influence than that of oaths, when applied to those purposes for which it was intended.' Scarce: only three copies on COPAC.